A new study adds to the debate about the role food advertising has in the childhood obesity epidemic. The study, published online Nov. 30 in the Journal of Pediatrics, finds obese children are more vulnerable to the food advertisements they may see on television, which in turn can make them more likely to eat as a result. "I think it raises the question, and it's a difficult question, of how ethical is it to advertise unhealthy food products to children, especially when we see that obese children are potentially more vulnerable to this type of advertising," study author Dr. Amanda Bruce, an assistant professor of psychology at the University of Missouri-Kansas City, told CBS affiliate KCTV in Kansas City. U.S. childhood obesity rates have tripled over the past 30 years, according to estimates from the Centers for Disease Control and Prevention. More than one-third of all U.S. kids are overweight or obese, setting themselves up for health problems like high cholesterol, high blood pressure, diabetes and heart disease. The study authors say companies spend more than $10 billion annually on food and beverage advertisements to children, while 98 percent of those products that make it to television are high in fat, sugar or sodium. For their small study, researchers compared a group of 10 healthy weight children to 10 obese ones who were between the ages of 10 and 14. Scans of the children's brains were taken with MRI machines when children were shown 60 food logos and 60 non-food logos. 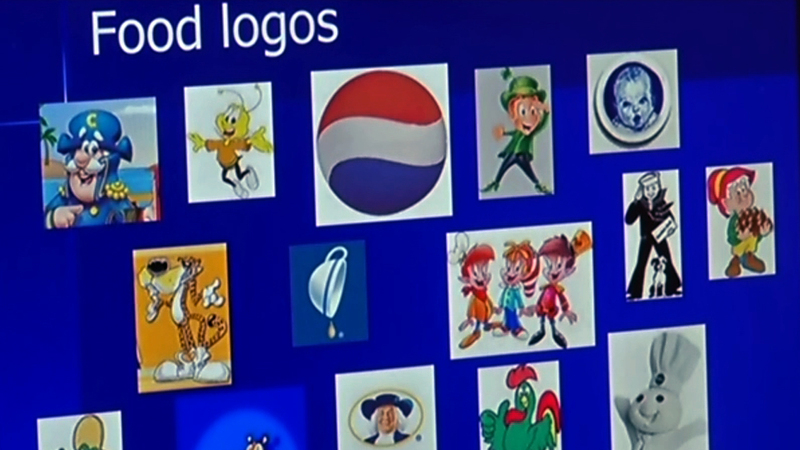 Food logos included popular brands like Pepsi, Cap'n Crunch and Cheerios, while non-food logos included the CBS Eye and Mercedes, according to KCTV. The researchers wanted to measure the kids' brain activity when viewing the ads. Children were also surveyed before and after the study to gauge their hunger and self-control levels. Obese kids showed greater activation in the rewards and pleasure centers of the brain, which lit up when they saw the food logos, compared with when they saw non-food logos. Healthy weight kids on the other hand also showed signs of brain activation when shown the food labels, but in brain's self-control centers. Healthy weight children were also more likely to report greater self-control when surveyed after, compared with the obese children. The researchers say the study adds more evidence to research that shows obese people may have a tougher time with self-control because of their brain activity. "In the 1950s and '60s, the favorite vegetable of children in the United States was spinach. That was because of Popeye. Even then we see marketing having a huge influence," Bruce said. "If kids are always getting what they want and getting unhealthy things, that could lead to changes in the brain." In June, the Walt Disney Companyannounced it would ban all food and beverage products advertised, sponsored or promoted on the Disney Channel, Disney XD, Disney Junior, Radio Disney and other Disney-owned online destinations intended for children 12 and under that do not fit certain nutritional standards by 2015.